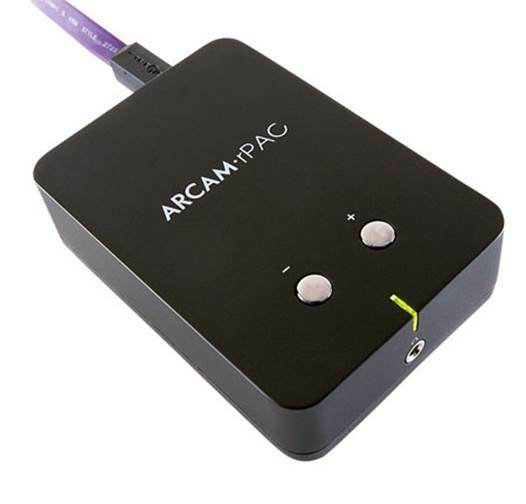 If we were missing the headphone output on the Arcam rDAC, Arcam’s got a pocket-sized alternative up its sleeve. 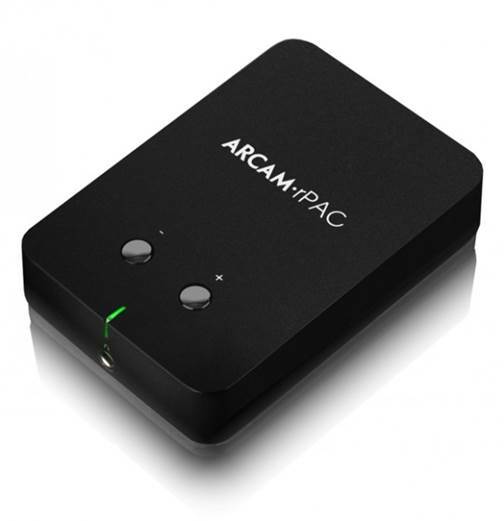 The Arcam rPAC doubles up as both a DAC and a headphone amplifier, all housed in a compact box that eschews the need for mains power. The rPAC weighs just 300g, making it light and portable enough to carry around in your bag if you’re using your laptop on the move. Connections are minimal but practical: a type-B USB input a pair of line-level RCA outputs and a headphone output. You can use the line-level outputs to connect to your existing hi-fi set up, but we imagine the rPAC’s most popular use will be between a laptop/computer and a pair of headphones. Rather conveniently, the rPAC comes with its own mini-USB to USB cable, but we found the wire length to be a bit too long, leading to tangled complications. In comparison, the supplied USB wires of other portable DACs in this test – such as the HRT micro-Streamer and the Meridian Explorer are much shorter and more practical. The only distinctive marking on the rPAC’s compact case is the volume control buttons: tap or hold to change the volume when using it with headphones. Reminiscent of the rDAC design, a single light indicator flashes red-to-green when the rPAC is in use, and blinks when changing the volume. Plug in a pair of headphones to the rPAC’s 3.5mm socket, and you’re good to go. The rPAC’s USB input handles file types up to 24 bit/96 kHz, which is ample opportunity to boost the sonic performance of your laptop when playing all types of music files. Play a WAV recording of The Noisette’s Don’t Give Up, and the sound is clear and detailed, with a smooth overall balance. There’s much of the dynamism and agile timing that we appreciated in Arcam’s rDAC, along with a great sense of naturalness to voices. Instruments are rendered with weight and rich textures, and overall it’s an enjoyable sound. There’s no sense of hardness or brightness to be found at all, which is great when you don’t want to wear your ears out with insistent, hard electronic beats. 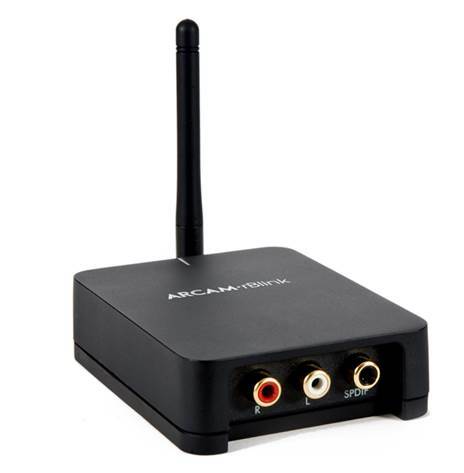 However, some might find the presentation just a touch too smooth, and it’s true that other DACs, such as the Audio quest DragonFly or the HRT micro-Streamer do offer a more attacking vibe. To round off the comparison, the HRT goes that extra mile in revealing a greater deal of subtlety and depth, with punchier bass-lines. In essence, the rPAC has the same sonic characteristics as the rDAC – but it’s a semi-skimmed performance compared with the rDAC’s full-fat, authoritative and detailed delivery. The rPAC’s portability and great price tag of $254.5 still makes it a desirable hi-fi option, but there are some newDACs on the block now. The emergence of even more compact and capable alternatives (the HRT, Meridian Explorer and DragonFly) means the rPAC has had a star docked. But don’t be deterred: it’s an enjoyable DAC that’s worth your money. 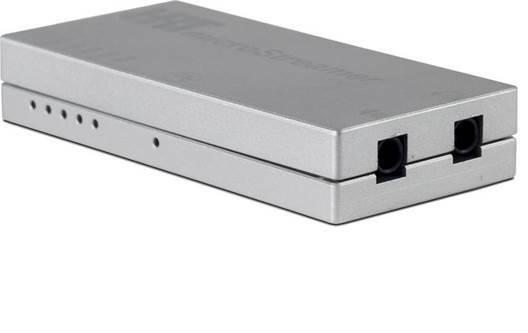 A DAC-and-headphone-amplifier tucked into a tiny, portable shell that’ll do wonders to the sound quality of your computer-stored music? That’s the HRT micro-Streamer down to a tee. 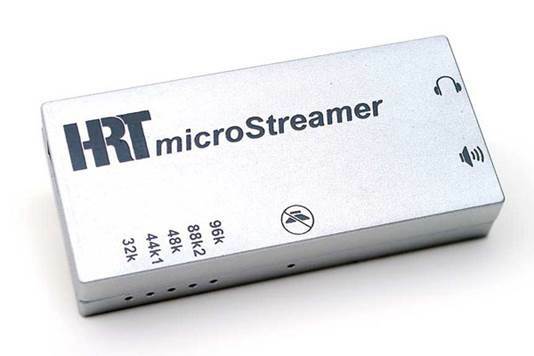 High Resolution Technologies is no stranger to producing great-sounding USB DACs – the Music Streamer II was a 2011 Award winner and they’ve gone and pushed the envelope even further with the micro-Streamer. Comparisons with the Audio quest DragonFly were rife in our offices, along with references to the newly launched Meridian Explorer. The micro-Streamer is a light aluminum enclosure with an asynchronous USB design. 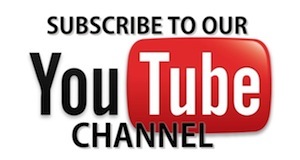 This means that it, rather than the circuitry in your computer, controls the data flow, leading to more accurate timing and better all-round performance. There are neat little icons on the fascia to identify the line-level and headphone outputs, as well as indicate mute status. 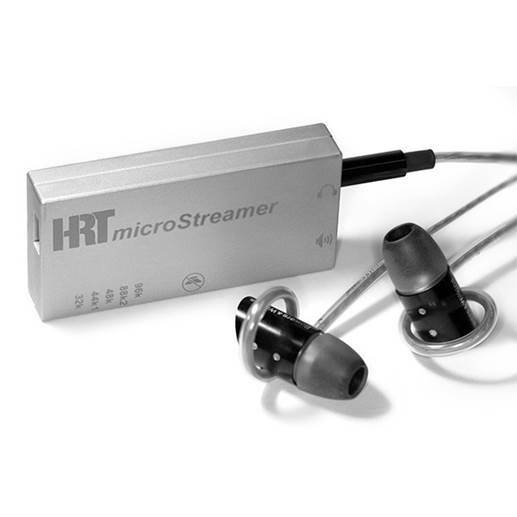 The micro-Streamer is capable of playing files up to 24-bit/96kHz resolution, and LED indicators on the side light up amber to show which kHz sample rate – 32, 44.1, 44, 88.2, and 96 – is playing. It’s nice to see such an informative system packed onto such a small surface area. Some might prefer the built-in USB connector design of the DragonFly, but the micro-Streamer is dinky enough to fit into the palm of your hand, and we like the flexibility of connecting it to your computer’s USB port with a very short (supplied) cable. That way, there’s no danger of knocking it out or damaging it when moving your laptop, as you might with the DragonFly’s design. Let’s come straight out with it – no other USB DAC of this design betters the brilliantly musical and dynamic performance of the micro-Streamer. Stream Rage against the Machine’s killing in the Name, and the sound is solid and muscular, with no hint of hardness. The ability to start and stop notes with precision is combined with a superbly agile sense of rhythm that allows the micro-Streamer to zing through the track with confidence. Enthusiasm and energy walk hand in hand with refinement and elegance here. A live recording of Yann Tiersen’s violin solo Sur Le Fil is revealing: the sense of space around the performance is amply conveyed, and the bow scraping across the strings feels raw and tangible. It’s the micro-Streamer’s ability to dig up layer upon layer of detail in a recording that delivers such an immersive experience. Voices are full of subtlety and rich textures that connect emotionally with the listener. The Meridian Explorer shares a similar level of detail retrieval and balance, but the micro-Streamer is just a touch more transparent, melodic and insightful.